Mount Adams is a peak in southern Washington visible from Oregon's Mount Hood on a clear day. This photo shows Adams from McNeil Point, an area on Mt. 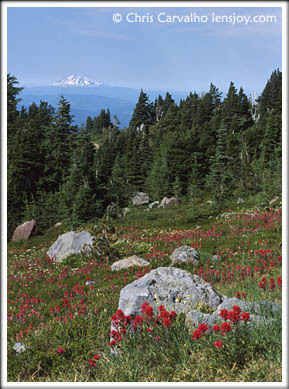 Hood known for its meadows blanketed with Indian Paintbrush. The trail to the area is an eight-mile round trip and a strenuous climb, but one I make a pilgrimage to every summer for its unusual beauty.  In this print you should be able to barely see shafts of sunlight coming through broken high clouds. During the brief summer season there is a continual ebb and flow of wildflowers that includes beargrass, lupine, paintbrush, heather, asters, and several other species. The gentian and rare elephant's head are also found here, though they are waning due to the growing number of visitors to the mountain. By staying on the trail despite the temptation to wander, these fragile areas can be protected for everyone to enjoy.